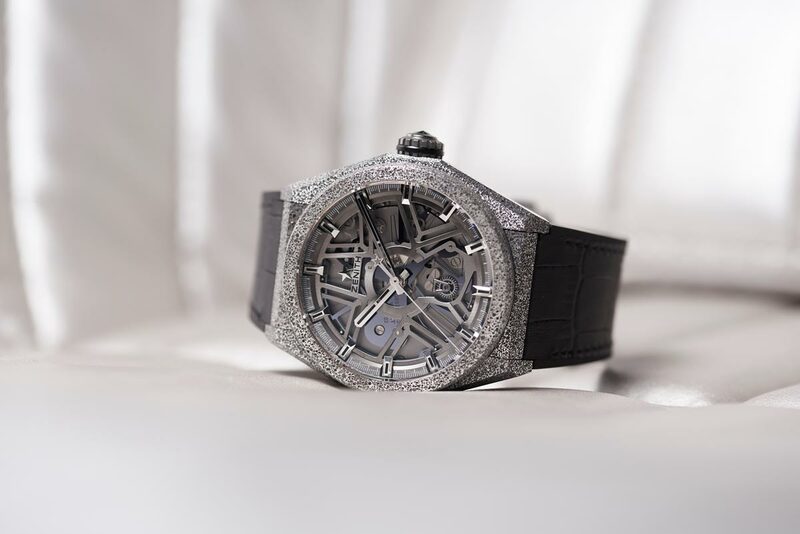 Zenith, the Swiss watchmaker founded in Le Locle in 1865 and now owned by LVMH, has just unveiled a new watch called the Defy Lab which is claims is the most accurate mechanical watch in the world. A bold statement indeed, and one that’s bound to be looked at askance by more expensive Swiss brands. What Zenith says they’ve done is basically throw out the balance spring principle which has been the embodiment of mechanical watchmaking since British physicist Robert Hooke came up with the idea around 1660, and Dutch scientist Christiaan Huygens built a functioning timepiece based upon it several years later. With the Defy Lab Zenith has created a new single-piece oscillator made of monocrystalline silicon, the base material for silicon chips, which takes the place of the 30-odd components of a balance spring system. It is also 10 times thinner at just 0.5 mm. To put it in perspective and drop science, the Defy Lab’s movement beats at 15 Hertz, with an amplitude of +/- 6 degrees, and features a 60-hour power reserve, more than 10% increase over Zenith’s iconic El Primero. The ultra-high frequency – three times more than the El Primero – makes it 10 times more accurate, Zenith says. It’s precision rate of just 0.3 seconds per day far exceeded the standards for COSC chronometer certification, and it can maintain its precision for 95% of its power reserve, an equally impressive feat. While the new Defy Lab movement is a bit bizarre looking, and certainly not as elegant as a classical balance spring engine, it has other advantages including no need for lubrication, ultra-high resistance to variations in temperature, gravity and magnetic fields; on this last point the watch exceeds ISO-764 magnetic criteria, meaning it can withstand 1,100 Gauss. 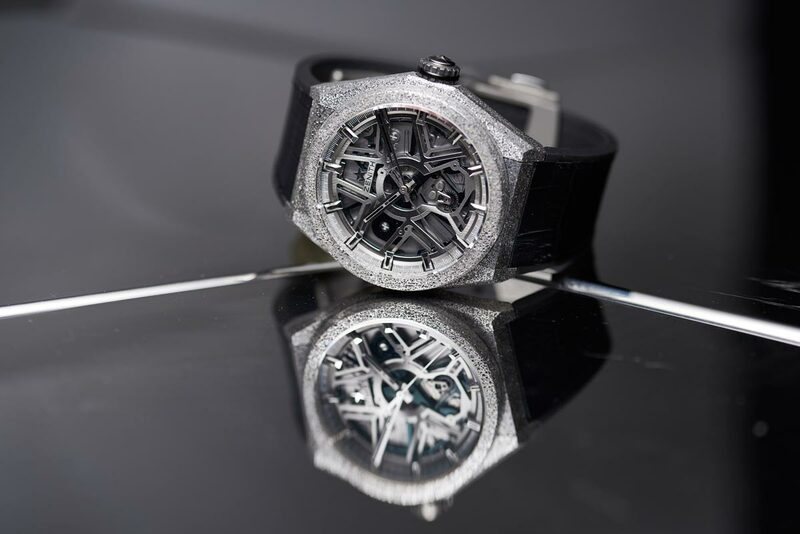 Zenith is launching 10 collector’s edition versions of the Defy Lab to start, and all have already been pre-sold. The 44 mm case of the Defy Lab is also a departure from the norm, being the first to be made from Aeronith, which Zenith says is the world’s lightest aluminum composite. The brand developed it using a proprietary “high-tech process” and says it is 2.7 times lighter than titanium, 1.7 times lighter than aluminum and 10% lighter than carbon fibre. Zenith credits Guy Sémon, CEO of the LVMH Watch Division’s R&D Institute, with help in developing the new case and movement, and obviously LVMH Watch Division President and Zenith CEO Jean-Claude Biver is sending a signal here that LVMH is prepared to invest heavily in technological development, another shot across the bows of Rolex, which remains the leader in traditional watchmaking innovation.